The CCC Kids Camp has been the only summer camp intensive in the Washington DC area for the past 4 years. Our seasoned co-directors offer over two decades of combined experience working with children with SM, have been trained by some of the world’s leading child treatment experts (Dr. Steven Kurtz, Dr. Sheila Eyberg) and most importantly, have experience and history running SM intensives and camps. We are not a franchise. We have worked hard to build our programming from the ground up, carefully refining program elements over time and grounding them in the evidence-based PCIT for SM protocol developed by Dr. Steven Kurtz. Why are Intensive Interventions Beneficial for Selective Mutism? 30 hours of massed practice leads to faster gains and more momentum compared to once weekly appointments. You get significantly more treatment hours for your financial investment. Timing of camp is strategically designed to provide a boost in confidence and skills prior to the start of a new school year. Children generalize to speak with up to 20 new individuals in camp within the course of a week! Subsequent fade in sessions at your child’s school and training of school staff can help kids generalize the skills to school after camp. The CCC Kids Camp is a day camp experience in a school setting which provides intensive behavioral treatment for children between the ages of three and nine with SM and/or severe social anxiety. We also offer opportunities for older children to participate in camp in a helper role. Our goal is to build your child’s confidence with speaking and engaging in activities with others directly prior to the return to school. The CCC Kids Camp is a structured experience in which children participate in a variety of engaging activities including outdoor sports, arts and crafts, and music. We also practice participating in typical classroom activities such as circle time, morning meeting, and center work. Other activities include checking out library books, making requests, and ordering food. These activities provide children with hands on practice in verbal participation with intensive and individualized support and reinforcement for brave behavior. The CCC camp is based on the PCIT-SM approach developed by Dr. Steve Kurtz through which Brave Buddies was established. Our staff are extensively trained in utilizing this protocol for eliciting and encouraging speech and social interaction throughout the camp week. 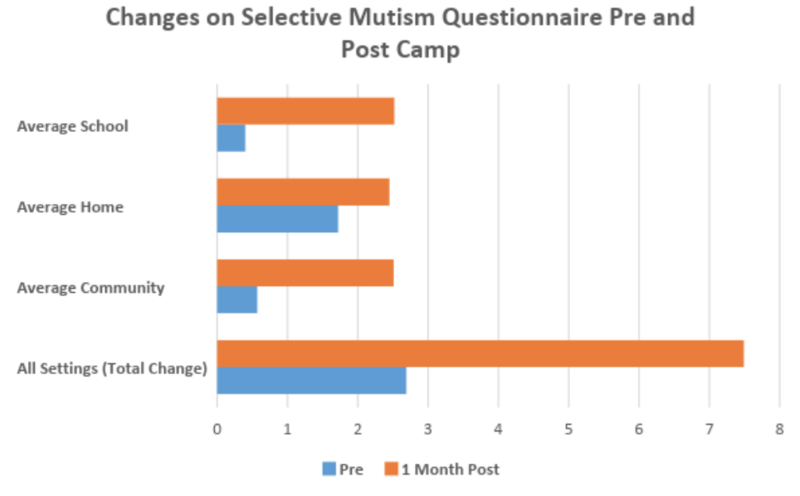 We utilized the Selective Mutism Questionnaire (SMQ), a well-validated rating scale that assesses the frequency of speech and social communication of children with Selective Mutism across multiple settings. We also used the Client Satisfaction Questionnaire (CSQ), a measure assessing client satisfaction with the program. 70% of parents of our campers (N=7) agreed to participate in our research. Each parent completed a survey prior to camp and one-month post camp. We are pleased to share that significant and meaningful changes were reported across settings, including at school when children began the new school year! We believe our success is due to careful program planning, hands-on training and ongoing supervision for our staff, and individual tailoring of goals and strategies to each camper’s needs. We strive to make sure the program works for you and your child. Reliable Change: In addition, 71% of campers participating in our research demonstrated reliable positive change across all settings and 100% of participating campers demonstrated reliable positive change in the school setting (i.e., the reliable change indices were significant). This means that their observable positive change is real and stable, not something likely due to chance or error in measurement. Client Satisfaction: 85.7% of parents participating in our survey rated the quality of service as excellent and 14.3% rated the quality as good. 71.4% of parents said they would definitely return to our program should they need support again and 14.3% said they would probably return. Please contact our intake coordinator at 301-593-6554, x23 for more information. Registration requires a deposit and completion of a 60-minute intake at our regular rate ($293). We will assess your child’s fit for our program during the intake and provide treatment recommendations. We require that each child has at least some speech with a therapist prior to starting the program. Your child may need to participate in lead in sessions to reinforce one to one speech with a therapist prior to starting in our program. Dates of Summer Intensive 2019: 9am-2pm, August 19th-23rd. Cost: Our 5-day program is $2600. Register by April 1st and receive the discounted rate of $2300. Helpers: We also offer options for older students to participate in the program at discounted rates. Please contact Dr. Raggi for more details.